Showing results for tags 'st valentine'. 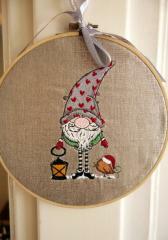 This is original embroidery sample which is able to be unusual symbol of New Year, Christmas or even… Valentine’s day. Don’t think so? Just look at ornament on gnome’s cap. It is created by many little hearts! So you realize that Gnome in phrygian cap with hearts holding lantern embroidery design is really universal sample useful for many goals. This is cool set of textile décor for your home. At first glance these dwarves seems suitable for Christmas and New Year holidays only. But when you look at them carefully you may find little hearts on cap of one gnome. So they are ok for Valentine’s day and other festivals. These pictures are Gnome in red phrygian cap and boots embroidery design, Gnome in phrygian cap with hearts holding lantern embroidery design and Gnome in polka dot phrygian cap and boots embroidery design. This is embroidered pillowcase executed from beautiful jacquard fabric. It is decorated of hearts embroidery and Happy together free machine embroidery design from our JBLON collection. This work piece can be good gift for Valentine’s day or anniversary of some memorable date. 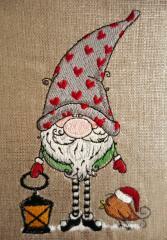 You may use Happy together free machine embroidery design to decorate not only home textile but also bag or clothing. Create your own original gift! This is pretty terry towel prepared by author for her beloved person as hand made gift for Valentine’s day. This cute work piece will fill his soul with warm feelings every time he goes to shower. 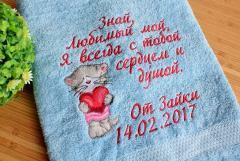 Thos towel is decorated with embroidered rhymes and Cat with heart embroidery design. It is really good idea of memorable and original present for St. Valentine. 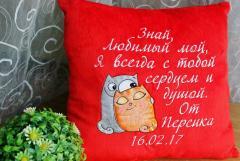 This is cute embroidered cushion made by Kreativnaya Shtuchka in bright color scheme. It makes it look like heart and it is really good gift for Valentine’s day. 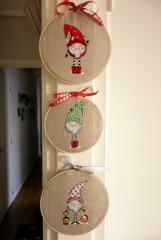 That is also because of pretty Cat's love 3 embroidery design. That is portrait of two fluffy cats felt in love. Furthermore this work piece is decorated with embroidered rhymes signed by cute home nickname. This is soft and comfortable terry towel prepared as gift for girl with beautiful name. It is decorated with it and her features. Furthermore author chose Bear with heart embroidery design to embellish it. Together all these elements show warm feelings that author has to her addressee. It is truly original and memorable way to congratulate your friend with her birthday.